MSF suspended activities in its recently-opened maternity hospital in Afghanistan's Khost Province after an explosion inside the compound injured seven people, including one child. Inside MSF's maternity hospital in Khost, where staff had delivered more than 600 babies since it opened a month ago. KABUL, APRIL 17, 2012—The international medical humanitarian organization Doctors Without Borders/Médecins Sans Frontières (MSF) today suspended medical activities in its recently opened maternity hospital in Khost Province in eastern Afghanistan, after an explosion inside the hospital compound this morning. Seven people were injured in the blast, including one child. "The suspension will continue until we receive assurances from the actors controlling the areas that medical activities can take place unhindered, and that the security of patients, medical staff, and health facilities will be respected, as previously agreed,” said Renzo Fricke, country representative for MSF in Afghanistan. Patients currently under MSF’s care will be referred to the maternity ward in Khost Provincial Hospital. No new patients will be admitted to the MSF facility for the time being. 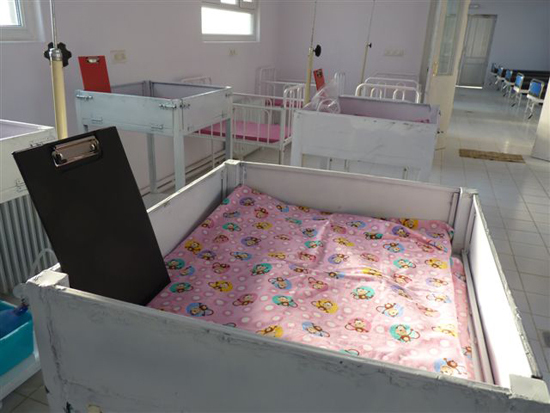 Since it opened last month, staff at the 56-bed MSF hospital have provided much needed maternal healthcare to 700 people and have delivered 600 babies. MSF teams also work in Ahmed Shah Baba Hospital in eastern Kabul and Boost Hospital in Lashkargah, Helmand Province. The organization also runs a trauma center in Kunduz, providing life-saving surgical care to people in northern Afghanistan. In all locations, MSF provides medical care free of charge and works in all wards of the hospitals.